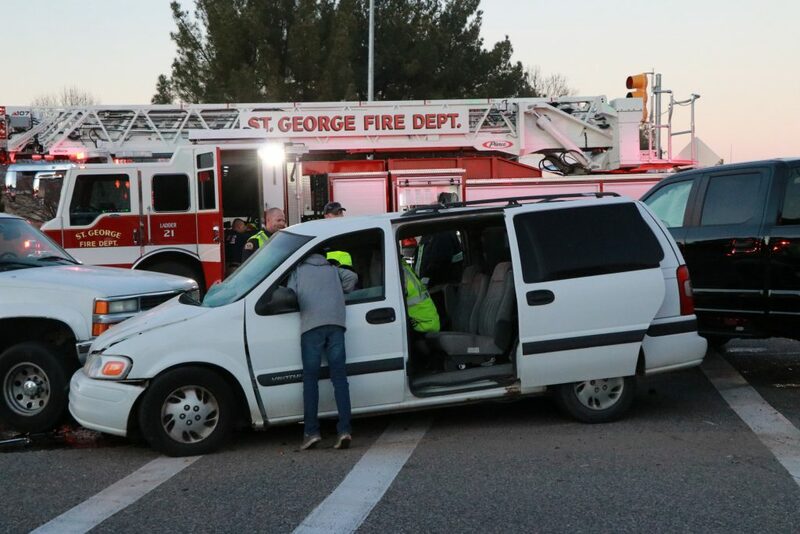 ST. GEORGE — A juvenile driver making a left turn onto Brigham Road Tuesday evening failed to yield to an oncoming pickup truck, leading to a three-vehicle collision, police said. 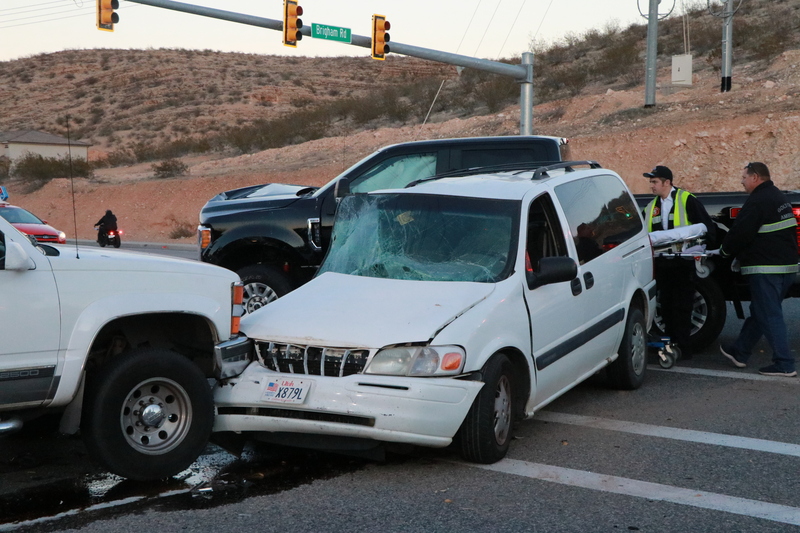 St. George Police officer Jonathan McInnes said the incident was reported shortly after 5 p.m. at the intersection of Brigham Road and River Road. The minivan, a Chevrolet Venture, was occupied by two male juveniles. 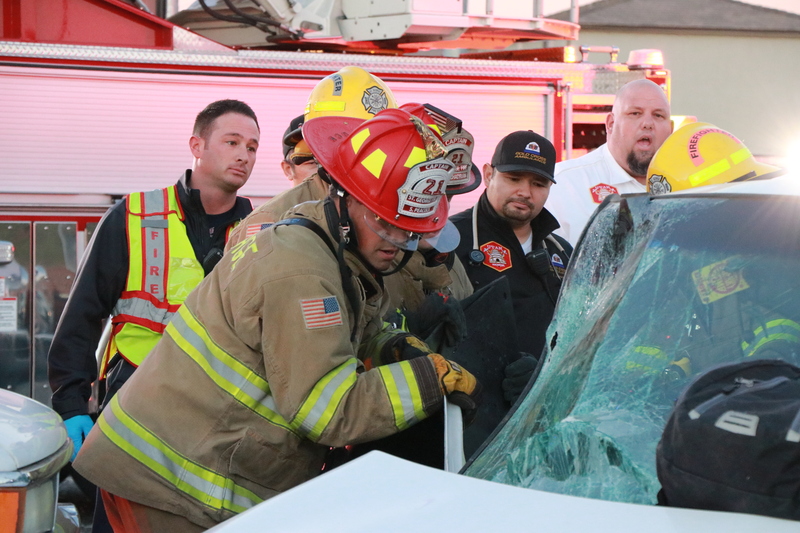 Responding firefighters used hydraulic tools to extricate the boy in the front passenger seat. 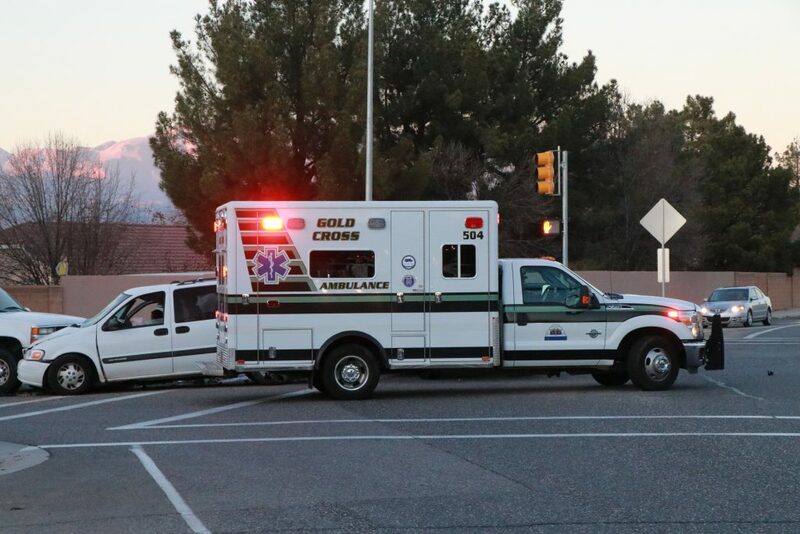 He was transported by Gold Cross Ambulance to Dixie Regional Medical Center for treatment for cuts, bruises and other injuries believed to be potentially serious but not life-threatening. 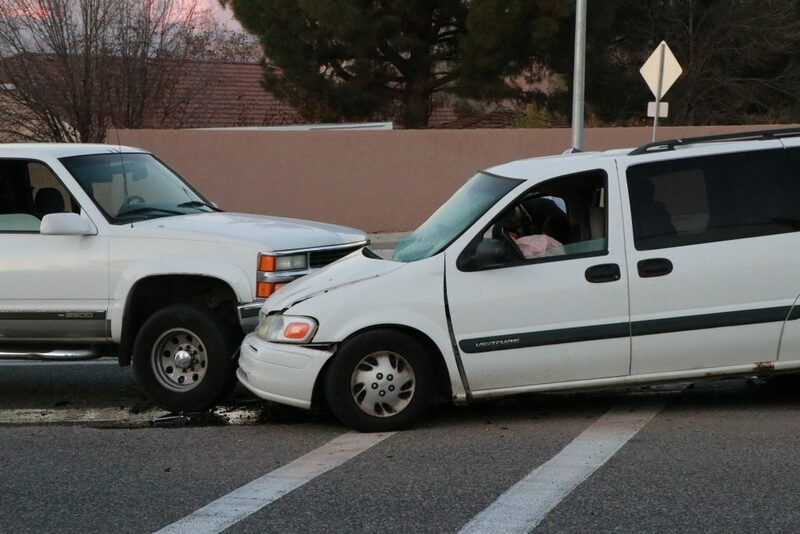 Meanwhile, the minivan’s young driver, who did not appear to have any outward signs of injury, was also taken to the hospital in a different Gold Cross ambulance as a precaution. 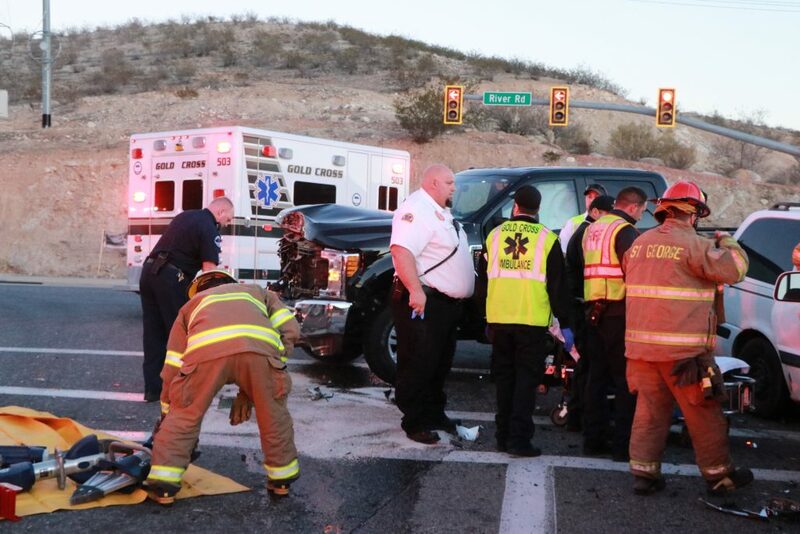 None of the three occupants of the other two vehicles involved – the adult male driver of the black Ford pickup and two men in the white Chevy pickup – reported any injuries. 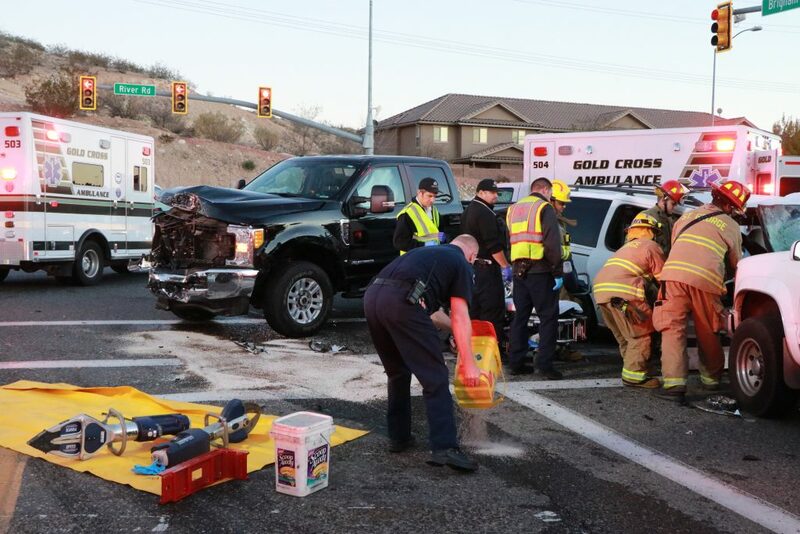 The three men, along with other eyewitnesses to the crash, remained at the scene while officers from St. George Police Department and deputies from Washington County Sheriff’s Office investigated and worked to clear the wrecked vehicles from the road. McInnes said the investigation will be turned over to the Washington County Sheriff’s Office because an off-duty St. George Police officer was the driver of the Ford pickup. 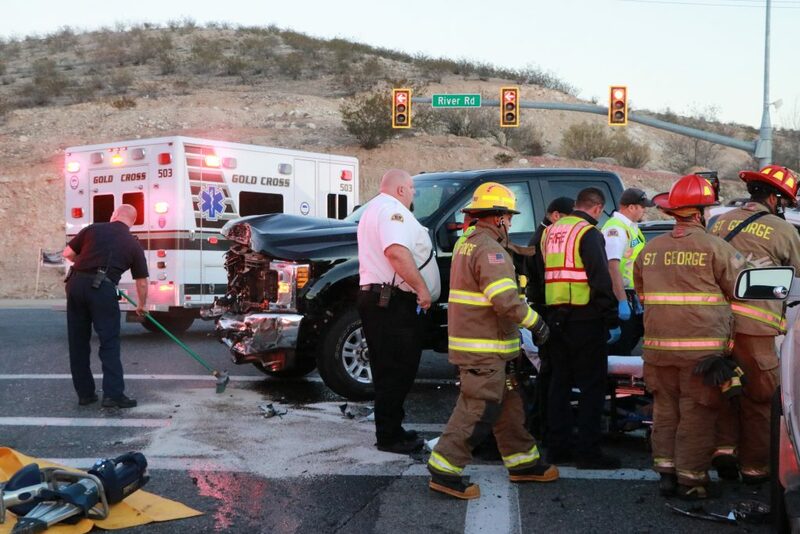 Both the Ford pickup and the Chevrolet minivan sustained heavy damage, with multiple airbags deployed in both vehicles. They were eventually towed from the scene. 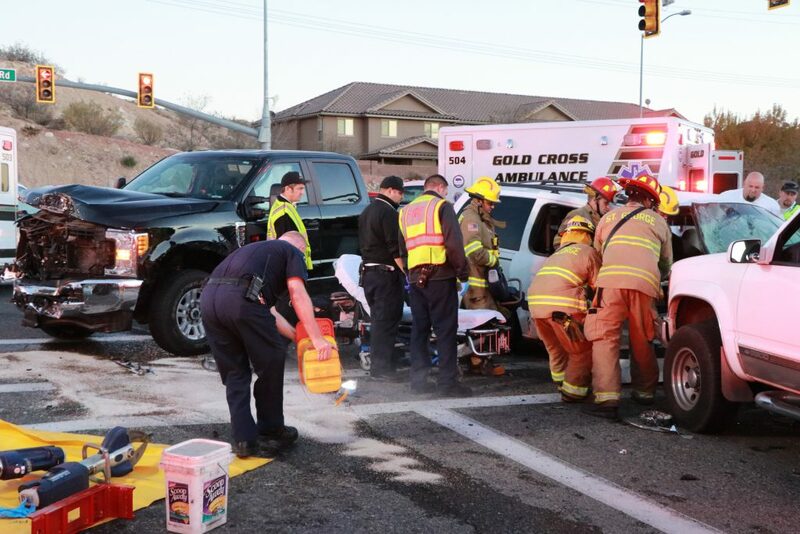 The Chevrolet pickup that was struck in the secondary collision received only minor front-end damage and was still operable. Its owner was able to drive it away. 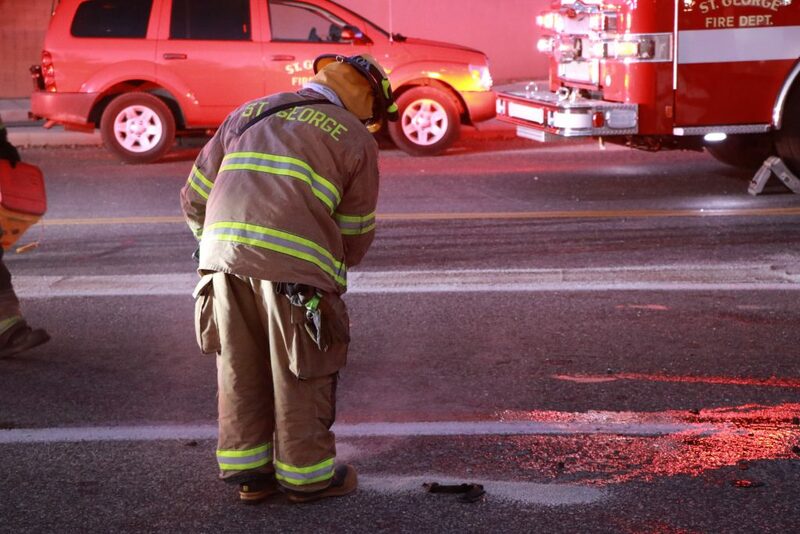 Firefighters from St. George Fire Department assisted with the cleanup, including taking care of broken glass and vehicle parts, in addition to oil and antifreeze spills on the roadway. Traffic in the area was impacted for an hour or more as crews worked to clear the scene. No citations had yet been issued at the time of this report, but the incident remains under investigation, authorities said.